Today, October 31, is Reformation Day, commemorating the 499th anniversary of the beginning of the Protestant Reformation. The day is associated with Martin Luther’s Disputation of Martin Luther on the Power and Efficacy of Indulgences which became popularly known as the 95 Theses. Luther sent this document to the Archbishop of Maenz, Albert of Brandenburg, on October 31, 1517, and a few days later, posted it on the door of the Church of All Saints in Wittenberg, Germany. This event is considered to be the spark that led to the Protestant Reformation, a major reform movement in the Christian church. In our church’s worship service yesterday morning, we sang Luther’s great hymn, Ein feste Burg ist unser Gott, usually translated into English as A Mighty Fortress Is Our God. 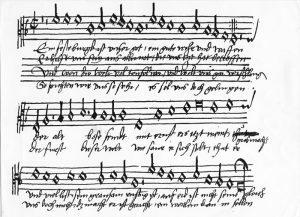 The image above shows the original version of the tune in the handwriting of Luther’s friend, Johann Walter. Luther composed the words and melody sometime between 1527 and 1529 and it has been used in churches around the world since that time, in particular since Frederick Hedge made his English versification in 1853. It was also used by Johann Sebastian Bach in his Cantata for Reformation Day, BWV 80. 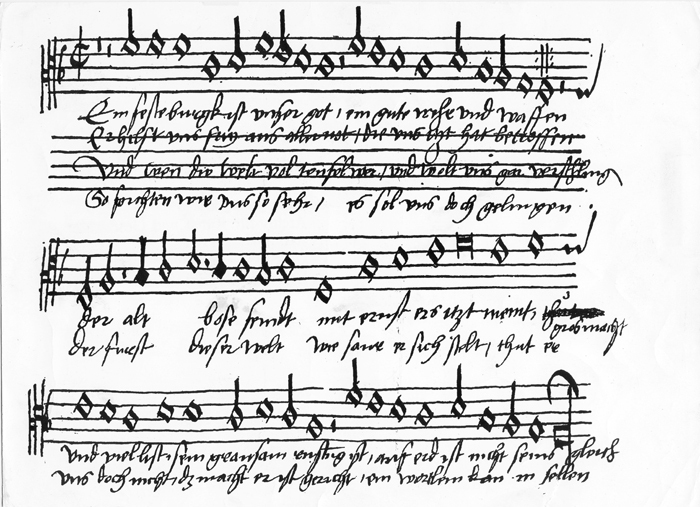 Martin Luthers Lied “‘Ein feste Burg ist unser Gott” in einer eigenh‰ndigen Niederschrift von Johann Walter, dem Komponisten der Melodie und Freund Luthers (Sammelhandschrift mit 139 liturgischen St¸cken). When I was a student at Wheaton College, I memorized the four verses of this hymn for extra credit in a class. While I was grateful for the extra credit, I’m very glad I took the time to memorize A Mighty Fortress. I call it to mind every day. Translations of texts into English that originally appeared in other languages help us to sing songs with understanding. But in the case of A Mighty Fortress, the standard English translation of the fourth verse has always struck me as being overly pleasant; it does not truly reflect the seriousness of Luther’s original text. This is all well and good, but the phrase, “Let goods and kindred go, this mortal life also,” sounds like we should simply let things go – let go of things, even our own lives, since they are, in the big scheme of things, not as important as knowing that one is a Child of God. That word they must let stand, no thanks to their own efforts. He is with us indeed according to the plan, with his Spirit and gifts. There still remains for us the Kingdom. Do you see the difference? It’s not a matter of just “letting things go.” No, THEY TAKE FROM US OUR BODY, POSSESSIONS, HONOR, CHILD AND WIFE. They will come for you and all that you hold to be dear. Persecution WILL come. The things that are most valuable and important to us – including our own lives – are not simply things that we will have to let go of. No. They will be taken from us. Yet God, who rules over this fallen, messed up world, reminds us that even when you have lost everything, you still have the most important thing: the Kingdom of God. This is a tremendous comfort for the Christian. We live in troubling times. Increasingly, in some parts of the world, to speak of the Christian faith leads to persecution, even death. Luther’s great text reminds us of this; it is as fresh today as when it was written centuries ago. Today, the 499th anniversary of Reformation Day, reminds us that in the midst of the trials and tribulations of life, God is there, our mighty fortress. luther_eine_feste_burg_02Martin Luther’s Ein feste Burg ist unser Gott, published by Josef Klug, 1533.